Did you see these headlines? NY Jets quarterback, Geno Smith, will miss half a season after a teammate hit him in the face, breaking his jaw. All the millions of dollars invested in players. All the preseason training and scheming. All the hopes of thousands of fans. Possibly, all undone over a $600 debt, because of a backup linebacker with a bad temper and a tendency for violent solutions. The Jets just can't seem to get out of their own way to put a winning team and season together. It's fascinating how some teams seem to consistently attract so much negative behaviour. Maybe it's the owner. Maybe it's the management. But even with coach and player churn they seldom manage to produce winners. Somehow they've developed a culture of losing and they can't lose its stench. Also circulating my way this week was an article by Joe McKeever titled, "59 things not to say to a preacher". Since I'm a preacher I have a vested interest in this article and agreed with many items on the list. But it's not just for preachers. Churches have as many possibilities to implode from Friendly Fire as football teams do. We're just more likely to use our tongues than our fists. Some church cultures breed these attitudes and behaviours rather than eliminating them. 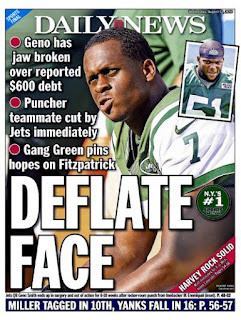 The destructive power of a strong word is no less than the force of the fist that impacted Geno Smith's jaw. Like the Jets, these churches many never figure out why they don't grow. They may never understand why newcomers don't stay. They may never grasp why their young people leave. They've developed a toxic culture and they don't notice the stench. What type of church culture do you contribute to the most?